A minor kitchen remodel, such as changing hardware, resurfacing cabinets and other minor improvements, can earn a high return on investment. It can help sell a home that can be difficult to unload, and help it command a higher price, making purchasing a fixer-upper home to flip worthwhile. Water Damage: Mold and other signs of water damage in a kitchen can indicate plumbing problems, such as leaking pipes. Hire a home inspector to review the plumbing to ensure that any leaks have been repaired correctly. Bad Cabinets: If your goal is to flip a house, then kitchen cabinets are some of the first things you want working and looking great, because they’re easily seen by homebuyers and can give a first impression of what condition a kitchen is in. 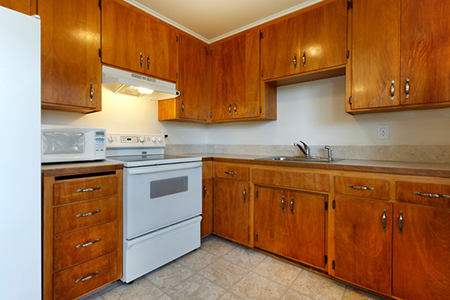 Check if the cabinets are rotted and need to be completely replaced, or if refinishing them will suffice. Lousy Flooring: The kitchen floor will likely have to be replaced on any fixer-upper home. If the flooring is peeling back or just looks lousy, then plan to replace it and add the cost to your budget. Asbestos Pipes: Asbestos was once commonly used to insulate pipes so they wouldn’t freeze in the winter. If the house you want to flip is old, you can expect to see asbestos start to break down. Fixing this can be expensive, mainly due to environmental requirements when removing asbestos. This problem could be a deal-breaker. Appliances: Old appliances are more likely to break than new ones, and new owners may be willing to pay extra for the peace of mind of having stoves, dishwashers and other appliances that definitely work. Check if existing appliances work, and, if they don’t, then plan on adding to the cost of the remodel.